All and only primitive Pythagorean triples are generated by three trees of Firstov, among which are the UAD tree of Berggren et al. and the Fibonacci boxes FB tree of Price. Alternative proofs are offered here for the conditions on primitive Pythagorean triple preserving matrices and that there are only three trees with a fixed set of matrices and single root. 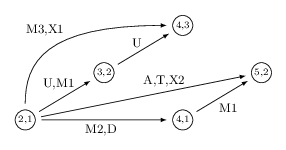 Some coordinate and area results are obtained for the UAD tree. Further trees with varying children are possible, such as filtering the Calkin-Wilf tree of rationals. Also by plain HTTP or by FTP or by RSYNC if desired. The sig file is a Gnu PG ascii armoured signature generated from my key. "Draft" means complete and believe correct as far as it goes, but likely to be rearranged, expanded, contracted, etc at some time. The LaTeX source uses PGF for pictures and it generates "postscript specials" so if you process to DVI you'll need a DVI viewer supporting that. Document copyright 2013, 2014 Kevin Ryde. Permission is granted for anyone to make a copy to read. The PostScript and PDF renditions contain fonts which are Copyright American Mathematical Society and licensed under the open font license. See Math::PlanePath::PythagoreanTree for Perl code implementing the trees. The corresponding PythagoreanTree section of the PlanePath image gallery has some pictures. See Trees of Rationals for a similar treatment of positive rationals. This page Copyright 2013, 2014, 2015, 2016, 2017, 2019 Kevin Ryde.